UPDATED: Wed., Sept. 6, 2017, 5:18 p.m. The poor air quality that has persisted throughout the region this week should continue for the next couple of days, with an Air Quality Alert in effect through noon on Friday. But some relief might finally be in store. From weather.gov: Air quality degraded across the region with most sensors across Eastern Washington currently in very unhealthy to hazardous conditions. 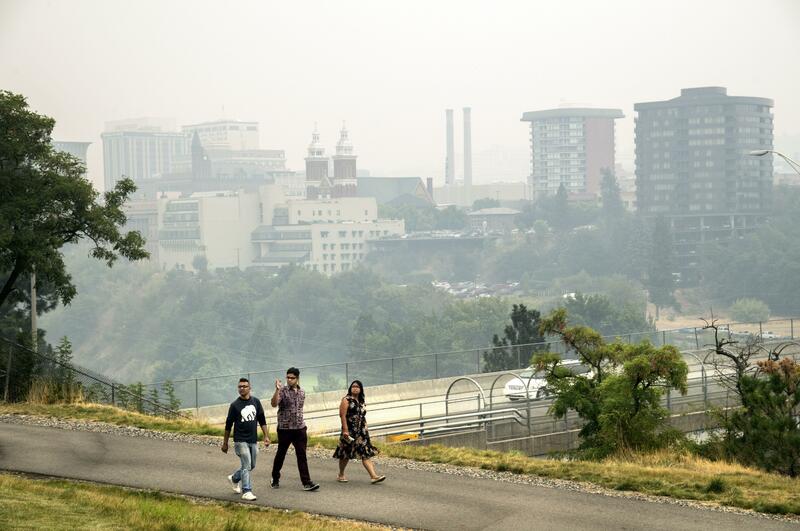 Northeast and east winds brought thick smoke in from Montana and BC wildfires. The easterly flow pattern will continue into Thursday, becoming lighter each day. The pattern is expected to persist until a cold front passage late Thursday, followed by an increased southwesterly flow by Friday morning. As for the actual weather, on Thursday there will be sunshine behind the smoke, with a high of 85. Clouds roll in on Thursday night with lows in the low-to-mid 60s across the region. There is a chance of sprinkles on Friday before 11 a.m., then widespread haze and partly sunny with a high near 86, with patchy smoke, and lows in the low 60s. The weekend features more of the widespread haze, with breezes in from the southwest to help start to clear things out a bit. Highs will be in the low 80 and lows in the upper 50s. Published: Sept. 6, 2017, 1:47 p.m. Updated: Sept. 6, 2017, 5:18 p.m.